Ramallah: Israeli forces plan to demolish more Palestinian homes in Area C of the West Bank, in what has clearly become a punitive act to punish Palestinian leaders. Following Israel’s failure to release Palestinian prisoners as a part of a confidence building measure ahead of peace talks, the Palestinian Authority unilaterally signed up to join 15 international conventions. It also is in the final stages of unity government with Hamas which has irked Israeli authorities. Area C compromises 65 per cent of the total size of the West Bank and is fully controlled by Israelis in terms of administrative and security matters. Israel has placed a halt on construction planning in Palestinian villages, the vast majority of which are located in Area C.
The Israeli daily Haaretz reported on Monday that the Israeli government had officially announced that the building permits in Area C are issued solely under the advice of planning experts. However the testimony of Maj. General Yoav Mordechai, coordinator of Israeli government activities in the West Bank to the Knesset Foreign Affairs and Defence Committee’s subcommittee on Judea and Samaria (West Bank) indicated political motivations are behind the decision to stop planning and building, the Haaretz reported. “Master construction plans for the Palestinian populations have been frozen,” Mordechai said. The committee convened after a request by the far right Israeli party Habayit Hayehudi to discuss the lack of enforcement of Palestinian building violations. 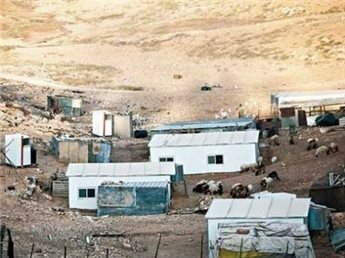 Following several petitions by Palestinian villages, the Israel public prosecutor announced that the villages’ councils can formulate building plans and submit them to the authorities and these projects will be examined with professional planning considerations. According to the data presented to the committee, there were 1,646 building violations in the West Bank in the year 2013. Of those violations, 1,288 were committed by Palestinians and 358 violations were found among the Jews. Major General Mordechai said Israel had demolished 373 illegal Palestinian structures and 147 illegal Jewish structures. The Palestinians, on the other hand, termed the committee’s meeting a serious indication of the immanence of many demolitions in Palestinian structures in Area C.
“The Israelis will start demolishing in Area C at an unprecedented pace that is expected to surprise the entire world,” said Abdullah Abu Rahma, the Palestinian General Coordinator of the Popular Committees to confront the Israeli segregation barrier and the colonial activities. “It is unfair and legally unacceptable to prevent the Palestinian villages and communities from their natural growth and expansion,” he told Gulf News, adding that the lands occupied by the demolished houses will be seized and granted to the colonists to expand their colonies and outposts. “Palestinian internal consultations are underway and the issue will be raised with the international community to show the Israeli breach of international law,” he maintained. Israel, as an occupying force, has duties under international law that should be fulfilled and one of the key Israeli responsibilities is granting the occupied nation with planned areas for construction. “Collective punitive measures under the international law are strictly forbidden,” Abdullah Abu Rahma said.